Hoyt LLC Research investigates and reports on security vulnerabilities embedded in Web Applications and Products used in wide-scale deployment. Bounty Hunting: NO BUGS = NO PAYMENT. Google Vulnerability Rewards Program as the example for payment terms and conditions. <div class="description" itemprop="description">Tami is great at everything. She is very knowledgeable about her products and services. She is very comfortable to be around and has great bedside manner. A Cookie was not marked as secure and transmitted over HTTPS. This means the cookie could potentially be stolen by an attacker who can successfully intercept and decrypt the traffic or following a successful MITM (Man in the middle) attack. This cookie will be transmitted over a HTTP connection, therefore if this cookie is important (such as a session cookie) an attacker might intercept it and hijack a victim's session. If the attacker can carry out a MITM attack, he/she can force victim to make a HTTP request to steal the cookie. Mark all cookies used within the application as secure. To exploit this issue, the attacker needs to be able to intercept traffic. This generally requires local access to the web server or victim's network. Attackers need to be understand layer 2, have physical access to systems either as way points for the traffic, or locally (have gained access to) to a system between the victim and the web server. Netsparker believes that there is a XSS (Cross-site Scripting) in here it could not confirm it. We strongly recommend investigating the issue manually to ensure that it is an XSS (Cross-site Scripting) and needs to be addressed. Due to content-type of the response exploitation of this vulnerability might not be possible in all browsers or might not be possible at all. Content-type indicates that there is a possibility of exploitation by changing the attack however Netsparker does not support confirming these issues. You need to manually confirm this problem. 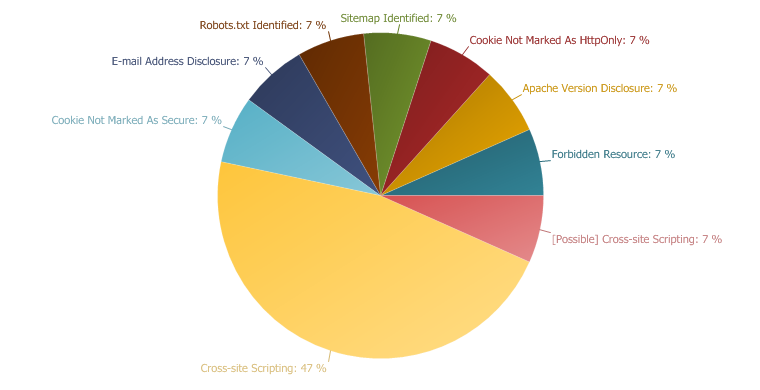 Generally lack of filtering in the response can cause Cross-site Scripting vulnerabilities in browsers with auto mime sniffing such as Internet Explorer. Netsparker identified that the target web server is an Apache server. This was disclosed through the HTTP response. This information can help an attacker to gain a greater understanding of the systems in use and potentially develop further attacks targeted at the specific version of Apache. An attacker can search for specific security vulnerabilities for the version of Apache identified within the SERVER header. Access to this resource has been denied by the web server. This is generally not a security issue, and is reported here for information purposes. There is no impact resulting from this issue. Netsparker found e-mail addresses on the web site. E-mail addresses discovered within the application can be used by both spam email engines and also brute force tools. Furthermore valid email addresses may lead to social engineering attacks . Use generic email addresses such as contact@ or info@ for general communications, remove user/people specific e-mail addresses from the web site, should this be required use submission forms for this purpose. Netsparker identified Sitemap file on the target web site. This issue is reported as extra information. This issue is reported as extra information, there is no direct impact resulting from this. <?xml version="1.0" encoding="UTF-8"?><urlset xmlns="http://www.sitemaps.org/schemas/sitemap/0.9"> <url><loc>http://www.genbook.com</loc><changefreq>weekly</changefreq><priority>1.0</priority></url> <url><loc>http://www.genbook.com/index.html</loc><changefreq>weekly</changefreq><priority>1.0</priority></url> <url><loc>http://www.genbook.com/manager/register</loc><changefreq>weekly</changefreq><priority>1.0</priority></url> <url><loc>http://www.genbook.com/sitemap.html</loc><changefreq>weekly</changefreq><priority>1.0</priority></url> <url><loc>http://www.genbook.com/manager/contactus</loc><changefreq>weekly</changefreq><priority>0.7</priority></url> <url><loc>http://www.genbook.com/about-genbook/index.html</loc><changefreq>weekly</changefreq><priority>0.7</priority></url> <url><loc>http://www.genbook.com/about-genbook/news-product-reviews.html</loc><changefreq>weekly</changefreq><priority>0.7</priority></url> <url><loc>http://www.genbook.com/about-genbook/partner-program.html</loc><changefreq>weekly</changefreq><priority>0.7</priority></url> <url><loc>http://www.genbook.com/about-genbook/press-releases/genbook-customer-reviews-now-published-to-google-places.html</loc><changefreq>weekly</changefreq><priority>0.7</priority></url> <url><loc>http://www.genbook.com/about-genbook/press-releases/genbook-launches-booknow-facebook-application.html</loc><changefreq>weekly</changefreq><priority>0.7</priority></url> <url><loc>http://www.genbook.com/about-genbook/press-releases/genbook-launches-genbook-mobile-optimized-for-the-iphone.html</loc><changefreq>weekly</changefreq><priority>0.7</priority></url> <url><loc>http://www.genbook.com/about-genbook/press-releases/genbook-makes-pcworld-magazines-list-of-incredibly-useful-sites.html</loc><changefreq>weekly</changefreq><priority>0.7</priority></url> <url><loc>http://www.genbook.com/about-genbook/press-releases/genbook-releases-multiple-calendar-view-feature.html</loc><changefreq>weekly</changefreq><priority>0.7</priority></url> <url><loc>http://www.genbook.com/about-genbook/press-releases/genbook-schedules-the-coupon-wielding-hordes.html</loc><changefreq>weekly</changefreq><priority>0.7</priority></url> <url><loc>http://www.genbook.com/about-genbook/press-releases/index.html</loc><changefreq>weekly</changefreq><priority>0.7</priority></url> <url><loc>http://www.genbook.com/about-genbook/press-releases/online-appointment-scheduling-is-a-competitive-necessity.html</loc><changefreq>weekly</changefreq><priority>0.7</priority></url> <url><loc>http://www.genbook.com/about-genbook/testimonials/index.html</loc><changefreq>weekly</changefreq><priority>0.7</priority></url> <url><loc>http://www.genbook.com/about-genbook/testimonials/page-2.html</loc><changefreq>weekly</changefreq><priority>0.7</priority></url> <url><loc>http://www.genbook.com/about-genbook/testimonials/page-3.html</loc><changefreq>weekly</changefreq><priority>0.7</priority></url> <url><loc>http://www.genbook.com/about-genbook/testimonials/page-4.html</loc><changefreq>weekly</changefreq><priority>0.7</priority></url> <url><loc>http://www.genbook.com/about-genbook/testimonials/page-5.html</loc><changefreq>weekly</changefreq><priority>0.7</priority></url> <url><loc>http://www.genbook.com/about-genbook/testimonials/page-6.html</loc><changefreq>weekly</changefreq><priority>0.7</priority></url> <url><loc>http://www.genbook.com/about-genbook/testimonials/page-7.html</loc><changefreq>weekly</changefreq><priority>0.7</priority></url> <url><loc>http://www.genbook.com/features/daily-deal-ready.html</loc><changefreq>weekly</changefreq><priority>0.7</priority></url> <url><loc>http://www.genbook.com/features/index.html</loc><changefreq>weekly</changefreq><priority>0.7</priority></url> <url><loc>http://www.genbook.com/how-it-works/benefits.html</loc><changefreq>weekly</changefreq><priority>0.7</priority></url> <url><loc>http://www.genbook.com/how-it-works/index.html</loc><changefreq>weekly</changefreq><priority>0.7</priority></url> <url><loc>http://www.genbook.com/how-it-works/tutorial-videos.html</loc><changefreq>weekly</changefreq><priority>0.7</priority></url> <url><loc>http://www.genbook.com/how-it-works/who-uses-genbook/acupuncture.html</loc><changefreq>weekly</changefreq><priority>0.7</priority></url> <url><loc>http://www.genbook.com/how-it-works/who-uses-genbook/chiropractors.html</loc><changefreq>weekly</changefreq><priority>0.7</priority></url> <url><loc>http://www.genbook.com/how-it-works/who-uses-genbook/consulting.html</loc><changefreq>weekly</changefreq><priority>0.7</priority></url> <url><loc>http://www.genbook.com/how-it-works/who-uses-genbook/counseling.html</loc><changefreq>weekly</changefreq><priority>0.7</priority></url> <url><loc>http://www.genbook.com/how-it-works/who-uses-genbook/financial.html</loc><changefreq>weekly</changefreq><priority>0.7</priority></url> <url><loc>http://www.genbook.com/how-it-works/who-uses-genbook/index.html</loc><changefreq>weekly</changefreq><priority>0.7</priority></url> <url><loc>http://www.genbook.com/how-it-works/who-uses-genbook/massage.html</loc><changefreq>weekly</changefreq><priority>0.7</priority></url> <url><loc>http://www.genbook.com/how-it-works/who-uses-genbook/medical.html</loc><changefreq>weekly</changefreq><priority>0.7</priority></url> <url><loc>http://www.genbook.com/how-it-works/who-uses-genbook/more.html</loc><changefreq>weekly</changefreq><priority>0.7</priority></url> <url><loc>http://www.genbook.com/how-it-works/who-uses-genbook/photography.html</loc><changefreq>weekly</changefreq><priority>0.7</priority></url> <url><loc>http://www.genbook.com/how-it-works/who-uses-genbook/salon.html</loc><changefreq>weekly</changefreq><priority>0.7</priority></url> <url><loc>http://www.genbook.com/how-it-works/who-uses-genbook/skin.html</loc><changefreq>weekly</changefreq><priority>0.7</priority></url> <url><loc>http://www.genbook.com/how-it-works/who-uses-genbook/spa.html</loc><changefreq>weekly</changefreq><priority>0.7</priority></url> <url><loc>http://www.genbook.com/how-it-works/who-uses-genbook/wellness.html</loc><changefreq>weekly</changefreq><priority>0.7</priority></url> <url><loc>http://www.genbook.com/legal/consumer.html</loc><changefreq>weekly</changefreq><priority>0.7</priority></url> <url><loc>http://www.genbook.com/legal/index.html</loc><changefreq>weekly</changefreq><priority>0.7</priority></url> <url><loc>http://www.genbook.com/legal/privacy.html</loc><changefreq>weekly</changefreq><priority>0.7</priority></url> <url><loc>http://www.genbook.com/pricing/index.html</loc><changefreq>weekly</changefreq><priority>0.7</priority></url> <url><loc>http://www.genbook.com/pricing/details.html</loc><changefreq>weekly</changefreq><priority>0.7</priority></url> <url><loc>http://www.genbook.com/bookings/slot/reservation/30011683</loc><changefreq>weekly</changefreq><priority>0.5</priority></url> <url><loc>http://www.genbook.com/bookings/slot/reservation/30011798</loc><changefreq>weekly</changefreq><priority>0.5</priority></url> <url><loc>http://www.genbook.com/bookings/slot/reservation/30012076</loc><changefreq>weekly</changefreq><priority>0.5</priority></url> <url><loc>http://www.genbook.com/bookings/slot/reservation/30011204</loc><changefreq>weekly</changefreq><priority>0.5</priority></url> <url><loc>http://www.genbook.com/bookings/slot/reservation/30011208</loc><changefreq>weekly</changefreq><priority>0.5</priority></url> <url><loc>http://www.genbook.com/bookings/slot/reservation/30011213</loc><changefreq>weekly</changefreq><priority>0.5</priority></url> <url><loc>http://www.genbook.com/bookings/slot/reservation/30011296</loc><changefreq>weekly</changefreq><priority>0.5</priority></url> <url><loc>http://www.genbook.com/bookings/slot/reservation/30011392</loc><changefreq>weekly</changefreq><priority>0.5</priority></url> <url><loc>http://www.genbook.com/bookings/slot/reservation/30011398</loc><changefreq>weekly</changefreq><priority>0.5</priority></url> <url><loc>http://www.genbook.com/bookings/slot/reservation/30011415</loc><changefreq>weekly</changefreq><priority>0.5</priority></url> <url><loc>http://www.genbook.com/bookings/slot/reservation/30011876</loc><changefreq>weekly</changefreq><priority>0.5</priority></url> <url><loc>http://www.genbook.com/bookings/slot/reservation/30012166</loc><changefreq>weekly</changefreq><priority>0.5</priority></url> <url><loc>http://www.genbook.com/bookings/slot/reservation/30012149</loc><changefreq>weekly</changefreq><priority>0.5</priority></url> <url><loc>http://www.genbook.com/bookings/slot/reservation/30010918</loc><changefreq>weekly</changefreq><priority>0.5</priority></url> <url><loc>http://www.genbook.com/bookings/slot/reservation/30010843</loc><changefreq>weekly</changefreq><priority>0.5</priority></url> <url><loc>http://www.genbook.com/bookings/slot/reservation/30010845</loc><changefreq>weekly</changefreq><priority>0.5</priority></url> <url><loc>http://www.genbook.com/bookings/slot/reservation/30010846</loc><changefreq>weekly</changefreq><priority>0.5</priority></url> <url><loc>http://www.genbook.com/bookings/slot/reservation/30010864</loc><changefreq>weekly</changefreq><priority>0.5</priority></url> <url><loc>http://www.genbook.com/bookings/slot/reservation/30011434</loc><changefreq>weekly</changefreq><priority>0.5</priority></url> <url><loc>http://www.genbook.com/bookings/slot/reservation/30011920</loc><changefreq>weekly</changefreq><priority>0.5</priority></url> <url><loc>http://www.genbook.com/bookings/slot/reservation/30011922</loc><changefreq>weekly</changefreq><priority>0.5</priority></url> <url><loc>http://www.genbook.com/bookings/slot/reservation/30012112</loc><changefreq>weekly</changefreq><priority>0.5</priority></url> <url><loc>http://www.genbook.com/bookings/slot/reservation/30010716</loc><changefreq>weekly</changefreq><priority>0.5</priority></url> <url><loc>http://www.genbook.com/bookings/slot/reservation/30011437</loc><changefreq>weekly</changefreq><priority>0.5</priority></url> <url><loc>http://www.genbook.com/bookings/slot/reservation/30011628</loc><changefreq>weekly</changefreq><priority>0.5</priority></url> <url><loc>http://www.genbook.com/bookings/slot/reservation/30011632</loc><changefreq>weekly</changefreq><priority>0.5</priority></url> <url><loc>http://www.genbook.com/bookings/slot/reservation/30011890</loc><changefreq>weekly</changefreq><priority>0.5</priority></url> <url><loc>http://www.genbook.com/bookings/slot/reservation/30010900</loc><changefreq>weekly</changefreq><priority>0.5</priority></url> <url><loc>http://www.genbook.com/bookings/slot/reservation/30010944</loc><changefreq>weekly</changefreq><priority>0.5</priority></url> <url><loc>http://www.genbook.com/bookings/slot/reservation/30010962</loc><changefreq>weekly</changefreq><priority>0.5</priority></url> <url><loc>http://www.genbook.com/bookings/slot/reservation/30011366</loc><changefreq>weekly</changefreq><priority>0.5</priority></url> <url><loc>http://www.genbook.com/bookings/slot/reservation/30011499</loc><changefreq>weekly</changefreq><priority>0.5</priority></url> <url><loc>http://www.genbook.com/bookings/slot/reservation/30011893</loc><changefreq>weekly</changefreq><priority>0.5</priority></url> <url><loc>http://www.genbook.com/bookings/slot/reservation/30011994</loc><changefreq>weekly</changefreq><priority>0.5</priority></url> <url><loc>http://www.genbook.com/bookings/slot/reservation/30011821</loc><changefreq>weekly</changefreq><priority>0.5</priority></url> <url><loc>http://www.genbook.com/bookings/slot/reservation/30012013</loc><changefreq>weekly</changefreq><priority>0.5</priority></url> <url><loc>http://www.genbook.com/bookings/slot/reservation/30011087</loc><changefreq>weekly</changefreq><priority>0.5</priority></url> <url><loc>http://www.genbook.com/bookings/slot/reservation/30011124</loc><changefreq>weekly</changefreq><priority>0.5</priority></url> <url><loc>http://www.genbook.com/bookings/slot/reservation/30011511</loc><changefreq>weekly</changefreq><priority>0.5</priority></url> <url><loc>http://www.genbook.com/bookings/slot/reservation/30011505</loc><changefreq>weekly</changefreq><priority>0.5</priority></url> <url><loc>http://www.genbook.com/bookings/slot/reservation/30011553</loc><changefreq>weekly</changefreq><priority>0.5</priority></url> <url><loc>http://www.genbook.com/bookings/slot/reservation/30011852</loc><changefreq>weekly</changefreq><priority>0.5</priority></url> <url><loc>http://www.genbook.com/bookings/slot/reservation/141498</loc><changefreq>weekly</changefreq><priority>0.5</priority></url> <url><loc>http://www.genbook.com/bookings/slot/reservation/152407</loc><changefreq>weekly</changefreq><priority>0.5</priority></url> <url><loc>http://www.genbook.com/bookings/slot/reservation/182796</loc><changefreq>weekly</changefreq><priority>0.5</priority></url> <url><loc>http://www.genbook.com/bookings/slot/reservation/30011550</loc><changefreq>weekly</changefreq><priority>0.5</priority></url> <url><loc>http://www.genbook.com/bookings/slot/reservation/30011895</loc><changefreq>weekly</changefreq><priority>0.5</priority></url> <url><loc>http://www.genbook.com/bookings/slot/reservation/30011945</loc><changefreq>weekly</changefreq><priority>0.5</priority></url> <url><loc>http://www.genbook.com/bookings/slot/reservation/276569</loc><changefreq>weekly</changefreq><priority>0.5</priority></url> <url><loc>http://www.genbook.com/bookings/slot/reservation/30011179</loc><changefreq>weekly</changefreq><priority>0.5</priority></url> <url><loc>http://www.genbook.com/bookings/slot/reservation/30011568</loc><changefreq>weekly</changefreq><priority>0.5</priority></url> <url><loc>http://www.genbook.com/bookings/slot/reservation/30011529</loc><changefreq>weekly</changefreq><priority>0.5</priority></url> <url><loc>http://www.genbook.com/bookings/slot/reservation/30010661</loc><changefreq>weekly</changefreq><priority>0.5</priority></url> <url><loc>http://www.genbook.com/bookings/slot/reservation/30010889</loc><changefreq>weekly</changefreq><priority>0.5</priority></url> <url><loc>http://www.genbook.com/bookings/slot/reservation/30011526</loc><changefreq>weekly</changefreq><priority>0.5</priority></url> <url><loc>http://www.genbook.com/bookings/slot/reservation/30011565</loc><changefreq>weekly</changefreq><priority>0.5</priority></url> <url><loc>http://www.genbook.com/bookings/slot/reservation/30011726</loc><changefreq>weekly</changefreq><priority>0.5</priority></url> <url><loc>http://www.genbook.com/bookings/..
Netsparker identified a possibly sensitive Robots.txt file with potentially sensitive content. Depending on the content of the file, an attacker might discover hidden directories. Ensure that you have got nothing sensitive exposed within this folder such as the path of the administration panel. If disallowed paths are sensitive, do not write them in the robots.txt and ensure that they correctly protected by means of authentication.